A brand that’s been loved by little girls for generations, My Little Pony Flip & Whirl Rainbow Dash Pony is probably the fastest flying pony ever made! Supplied with extra rainbow stickers for ultimate customisation, this gorgeous toy is every little girl’s dream. Place Flip & Whirl Pony into a seated position and watch as she performs an amazing backflip! She can also be programmed to speak lots of fun phrases, to keep kids entertained for hours. Perfect for children of 3 and over, this version of My Little Pony is just one of many other models available at many different price points. 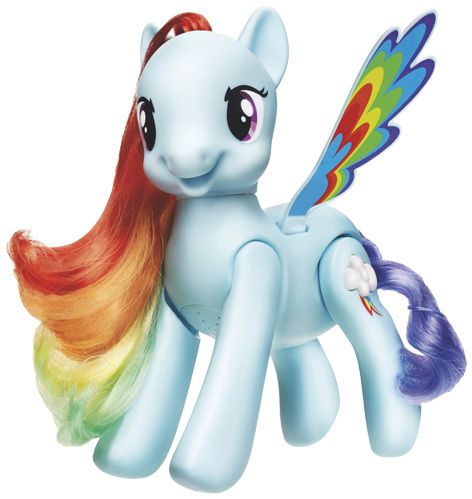 Please tell us what you think of the My Little Pony Flip & Whirl Rainbow Dash Pony by Hasbro.